We’re in the midst of football season and we’re celebrating as much as we possibly can. From pumpkin picking to college football, we’re enjoying every minute of the cool temps and fun weekend activities of this season. Let’s be honest, we really love these weekend social gatherings for the food and drinks, so we’re always on the lookout for new recipes to serve to our friends. We discovered our new favorite beverage of choice while shopping for an upcoming football party at Stop & Shop, and it’s been our staple item ever since! We walked right inside to pick up some fun snacks and immediately came across Cherry Dr Pepper® in football packaging. How cute?! Not to mention, it made our shopping experience so fast and easy when we had a full day of prep and party ahead of us. For game day snacks, savory usually reigns supreme at both tailgates and couches. Between all of the nachos, wings and pizza‚ sometimes we just need something sweet! 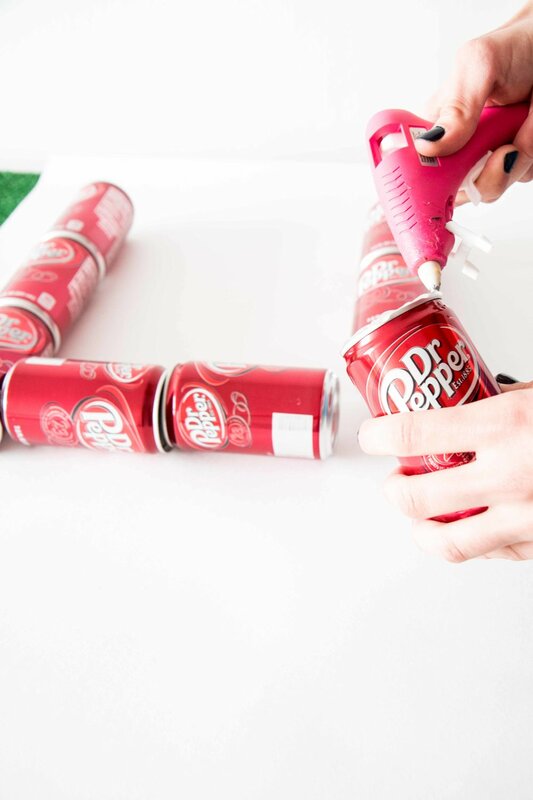 We broke out a few cans of the Cherry Dr Pepper® and used them to create a delicious dessert with an unexpectedly sporty spin. Preheat oven to 350 degrees and grease 9” baking pan. In a saucepan, reduce 8oz of the Cherry Dr Pepper® until it is the consistency of syrup. Let cool. Add 2 tbsp vanilla frosting and Cherry Dr Pepper® syrup mixture, mixing together with crumbled cake until it becomes a dough-like consistency. Shape mixture into footballs and let set up in the fridge for 15 minutes. Melt your chocolate per the bag instructions. Dip the top of paper stick into melting chocolate and carefully slide your paper sticks into the footballs, like a pop. Let harden for 5 minutes. Dip your pops into melting chocolate covering the cake entirely with chocolate. Use a foam base to stand your pops up and place back in the fridge to set. Using a mini piping bag, use remaining white frosting to create laces, keeping the pops standing up as they dry. Once our cake pops were complete, we stuck them in our football field- inspired tray of wheatgrass & placed that on top of some turf. We hung up our chalk game board, and set up a cake stand full of cans of ice cold Cherry Dr Pepper® for everyone to enjoy. 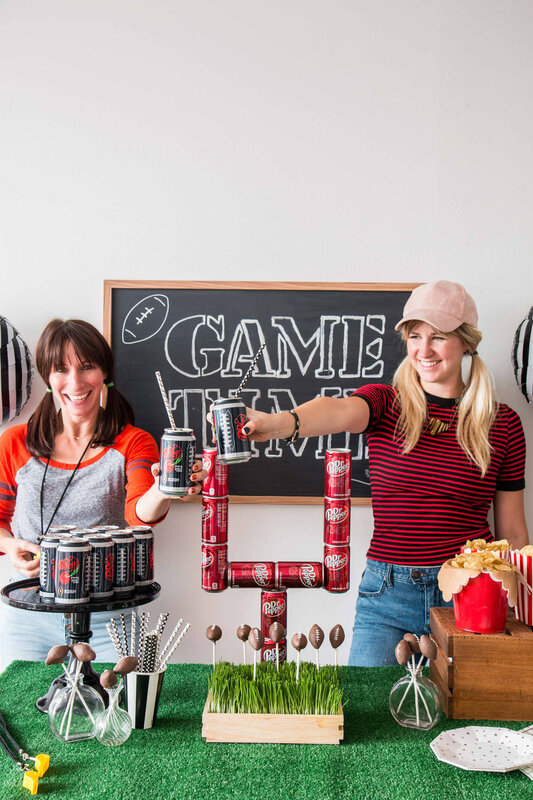 We even crafted a goal post centerpiece using mini Dr Pepper® cans! Use empty cans with some hot glue and voila! What better way to recycle?! A few referee whistles, striped balloons, black & white cups, and a paper banner tied our tablescape together. Finally it was time for kickoff, and time to party! 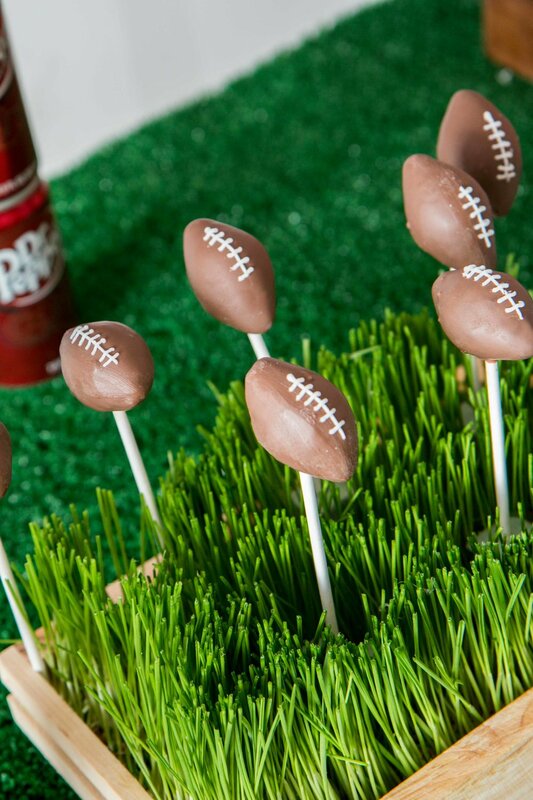 We snacked on some chips, enjoyed our sweet cake pops, and sipped on Dr Pepper®. Happy fall, and we hope you’re enjoying football season as much as we are! For more inspiration check out Dr Pepper’s tailgating page here.